Wilton Manors is a quickly growing city, boasting a large population of almost 13,000 despite its tiny size of only 2 miles wide. 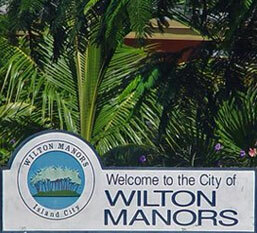 Wilton Manors is known as the "Island City" since the city is bordered by the North and South Forks of the Middle River, smack dab in between Oakland Park and Ft. Lauderdale Moves in the heart of Broward County. Despite its highly diverse population, Wilton Manors is considered to be a gay village, and ranks as 3rd in the entire country for its percentage of gay residents in relation to the total population of the city. The neighboring city of Ft. Lauderdale follows in 4th place in the metropolitan category. The Wilton Manors City Commission is partly staffed by openly gay elected officials. Wilton Manor real estate is in high demand, sprouting beautiful and modern new developments all over the Manors. Within the coveted Island City are the following up and coming neighborhoods: Coral Shore, Lazy Lake, Middle River and Poinsettia Heights. Popular city condos and rental communities include Belle Isle, Casa Seville, Drake Tower, Grand Wilton Place, Island City Lofts, and Wilton Station. Moving On Up™ offers local office moves and home relocation for all of the Tri-County area. Have a Questions? If you need assistance planning your move, give us a ring at 1-800-945-9569 to speak to one of our friendly moving consultants. For more information on our moving company’s low rates for inter-city moves, please visit our web page for Professional Packing Services, which has pricing rates and available package deals and other seasonal promotions. If you currently reside in Wilton Manors and are planning to move outside of the state of Florida, please visit our web site's long distance moving page for detailed information on interstate moves along the east Coast or across the country. Moving On Up™ offers one month FREE storage for local and interstate Florida moves. Ready to move? Contact Moving On Up™ now for your free in-home visual estimate in Wilton Manors. To schedule your estimate, submit your quote now or speak to a moving consultant at 1-800-945-9569.